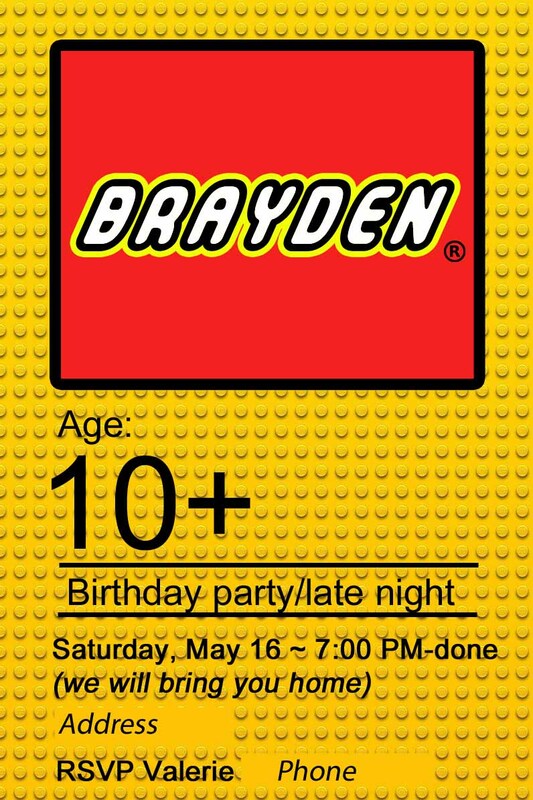 For Brayden’s 10th birthday this year, he wanted a LEGO theme party. 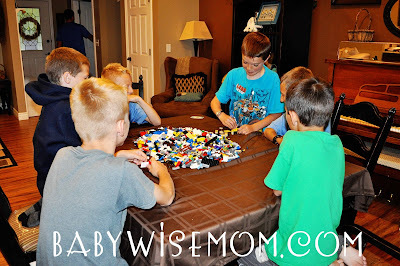 We played some games, age some food, and watched the LEGO Movie. I decided for his party to really focus mostly on food. Boys love food, especially boys the age of Brayden (and old…probably for the rest of life). They appreciate food so much more than decorations. This post contains affiliate links. Here is the invitation. 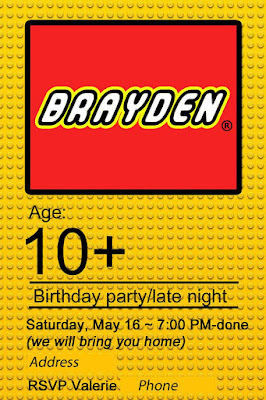 You can get the LEGO font for free here. I purchased these Lego Molds from Amazon. The first thing I did was make a bunch of ice cubes. After a couple of rounds, I got the idea to add some food coloring to the ice cubes. The boys liked the ice cubes waaaaaay more than I thought they would. They were so excited about them and though they were so cool. They also loved the color aspect–as they added them to their drink, they would make new colors. One note, their fingers got messy touching food coloring ice. It wasn’t a problem with these older kids, but if you are having younger kids at a party, you might want to go for clear. As the ice was done, I put it into a bowl to keep in the freezer. I just made it all the day before the party. Once the ice was done, I moved on to chocolates. All I did to make these was melt chocolate chips then pour the melted chocolate into the molds and then put them in the fridge to cool. One bag of chocolate chips filled up all 3 molds. It only took a few hours for the chocolates to harden in the fridge and be ready for removal. 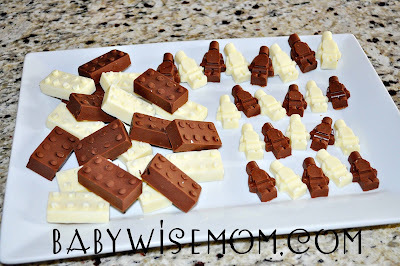 The boys also looooved these chocolates. They ate them during the movie.Big hit. 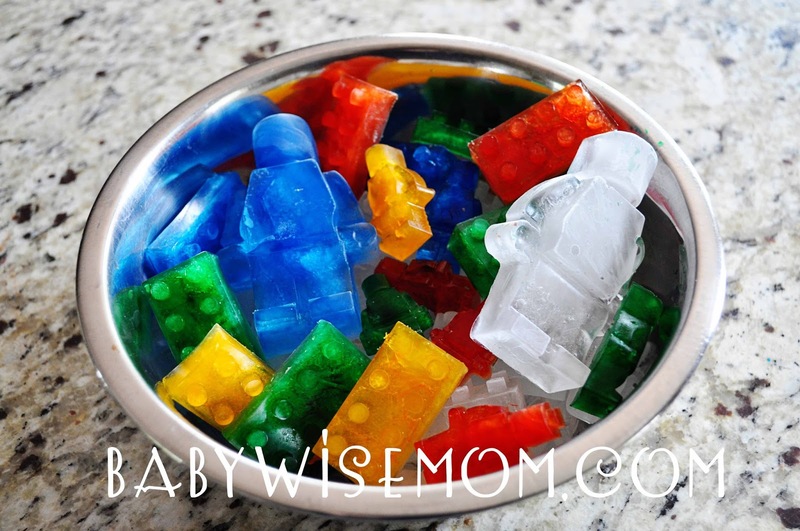 And you could make all sorts of things in the molds, like these gummy candies. 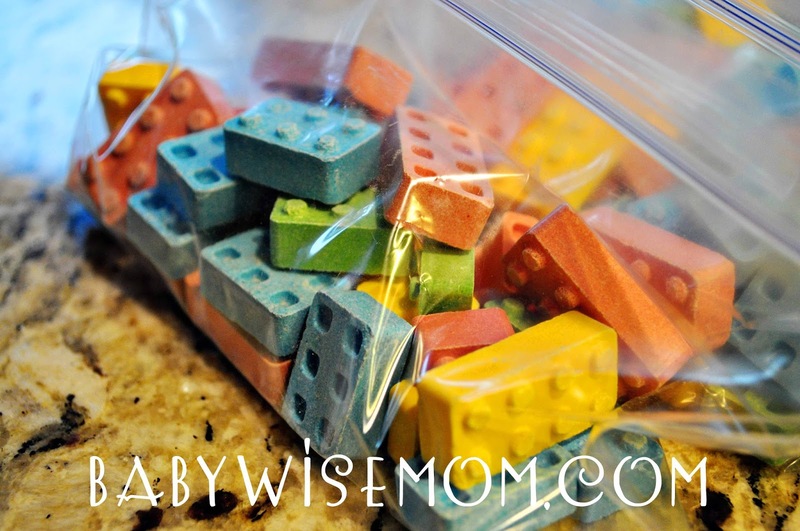 I also purchased these Candy Blox Blocks on Amazon. I bought the 2 pound bag, which was more than enough. I used these as small prizes for winning rounds in games played. 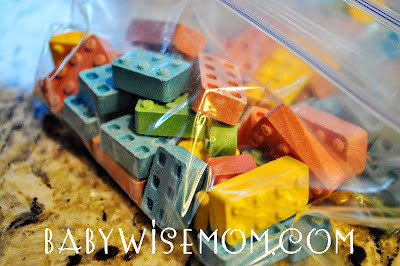 I also gave each boy a baggie of them to eat during the movie. The boys love this candy. Then we of course did the LEGO cake. This is just a cake cooked in a 9x11ish size pan. Then you cut it into pieces (we did 3). Frost it. Then frost the Oreo (you can use marshmallows cut, which I had done before, but this is easier). Put the frosted Oreo on and touch up as needed. We had this with ice cream. We also had popcorn with the movie. As the boys arrived, I had them guess how many LeGOs were in the mason jar. They filled out their guesses and put them on a slip of paper. They put the slip of paper into the Yellow Cup LEGO face (made with a simple Sharpie). Later in the party, I went through the guesses and gave a prize to the person who guessed the closest. I waited until after the car racing competition, described below, was over so the same child wouldn’t win both games. It wasn’t an issue in the end, but I wanted to be sure. For the prize, I did a LEGO Creator set. I had thought about doing the mason jar of LEGOs, but buying a set of LEGOs I could put in the jar would have cost more than the creator set. I also had this set out for the boys to look at. 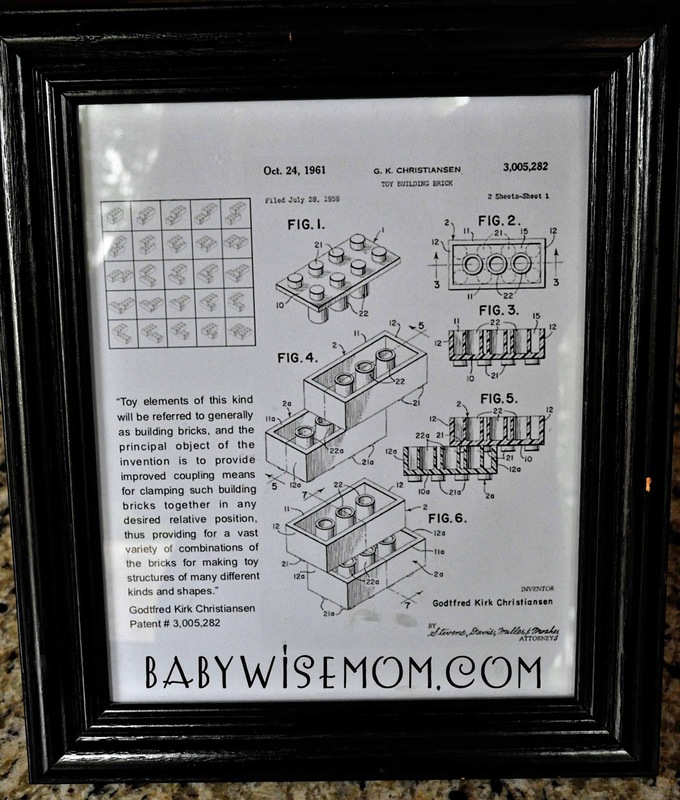 It is the original patent for the LEGO. The boys were very interested in this. Again, I think it was of great interest because they are older. For younger children, this would likely just be a nice decoration. I just put it in a frame I already own and used it for the night. Once all of the boys were there, we played our first game. It was like “pictionary” but building LEGOs. Lego actually makes a game called LEGO Creationary Game, which is currently outrageously priced on Amazon (perhaps it is no longer made?). We own it, so we used the cards from the game, but Brayden wanted to just us a big pile of his LEGOs instead of the ones from the game so there could be more variety. We just went around the circle. The boy picked one picture from the card I gave him. 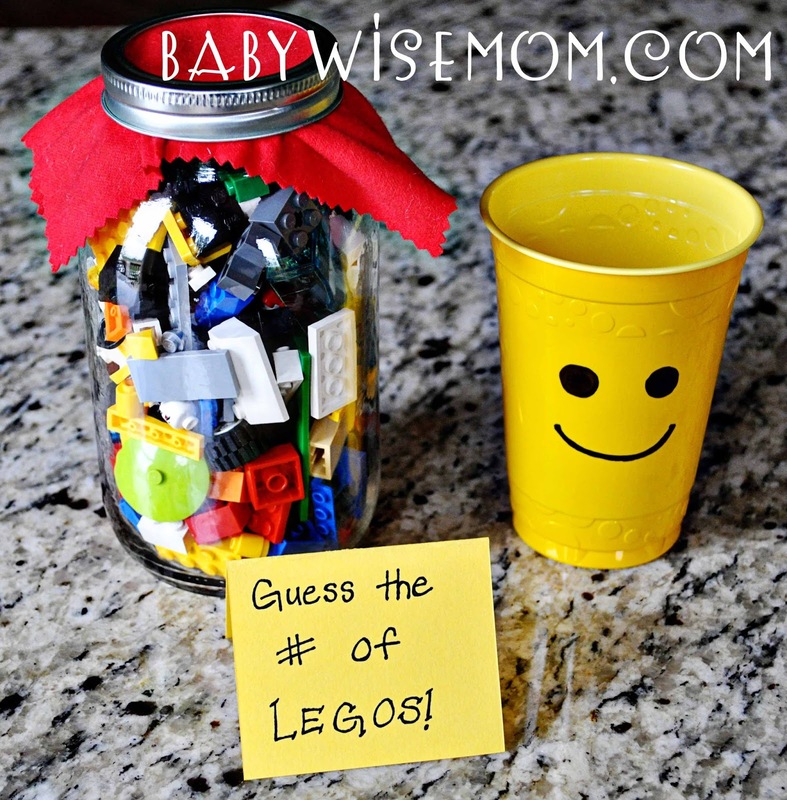 The first person to guess what it was got a couple of the Candy Blox candy pieces. If you want cards for the game, Amazon has a booster pack (Lego Creationary Game Booster Pack) you could get. Or you could make your own cards for basically free. The boys were totally into this. Brayden actually didn’t even know I took pictures while they were playing (he has been looking over my shoulder as I write this). One of Brayden’s favorite things he did at LEGOLAND when we went this year was build his own minifigure. I found a kit on Amazon that is a Bag O’ Bricks (Lego Minifigure Grab Bag). 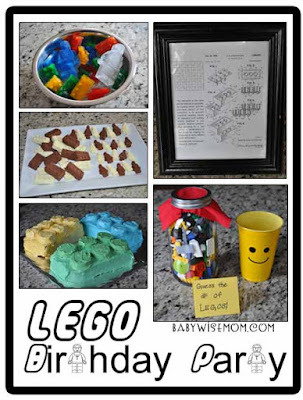 It has pieces to make several minifigures. It says 10, but I read reviews and one said it is 8, so plan on that. I separated the pieces out as shown above. I then wrote the numbers 1-6 on slips of paper. We went in rounds. For round one, they each chose as number and then chose a head in order number. So number one went first and so on. Then the slips went back and they all drew numbers again and chose a body in number order. This way it was all random but the order was different every time. It worked well. The boys took this minifigure home with them. Our final game was car racing. The boys first designed and built a car. Brayden has enough pieces that we didn’t have to buy anything (we had gotten him this LEGO Education Wheels Set for last Christmas. That worked out!). For the ramp, we used a Lifetime table we own with a piece of cardboard taped to the bottom. Fancy huh? Boys don’t care. They don’t even notice. 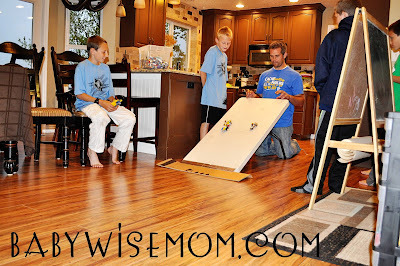 As they built, we had the ramp up so they could test it out. My husband is a mechanical engineer and worked as a mechanic through college, so he gave them pointers on how to make a good car. Some listened and some still did their own thing. We put names on slips of paper and drew them out for the brackets. They raced each other and did the best two out of three. Single elimination. We wrote it out on the chalkboard you can see on the right side of the picture above. The winner of it all won a LEGO Creator Blue Racer Set. We then did presents and cake and ice cream. That all took us about 2.5 hours. I had more planned (better to have too many ideas than not enough). We then watched The Lego Movie. The party started at 7 PM so we could do activities and go into a “late night” of watching The Lego Movie. I set out the Lifetime table with the food and drinks. The boys ate their treats while watching the show. The party was a huge hit. It was really simple to prepare for. It was inexpensive. The boys had a great time. One thing to note, the Yellow Cup is not that easy to find. We luckily had a few. We bought red cups since red is a LEGO color. We used those for drinks and for the boys to put their popcorn in. We used our few yellow for the paper slips, forks, etc. If you really want a yellow one for each boy, start looking early enough to try a few stores or just order online. 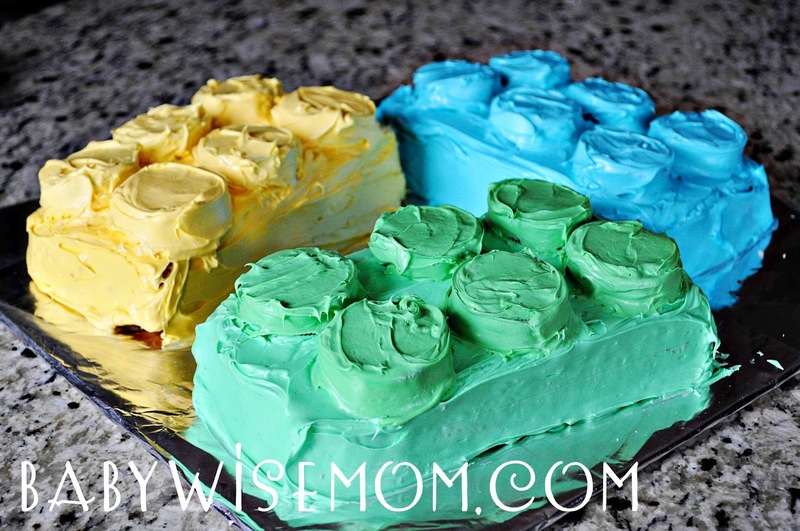 For a whole lot of ideas, including all places where I got my inspiration, see my Birthdays and Parties Pinterest board. There are a lot of good ideas there.